Family Favorite Shrimp and Macaroni Salad was always my father’s choice whenever I asked him what I should make for a family party. It’s a diet splurge, but this salad is pure comfort food. Click here to PIN Family Favorite Shrimp and Macaroni Salad! Family Favorite Shrimp and Macaroni Salad! 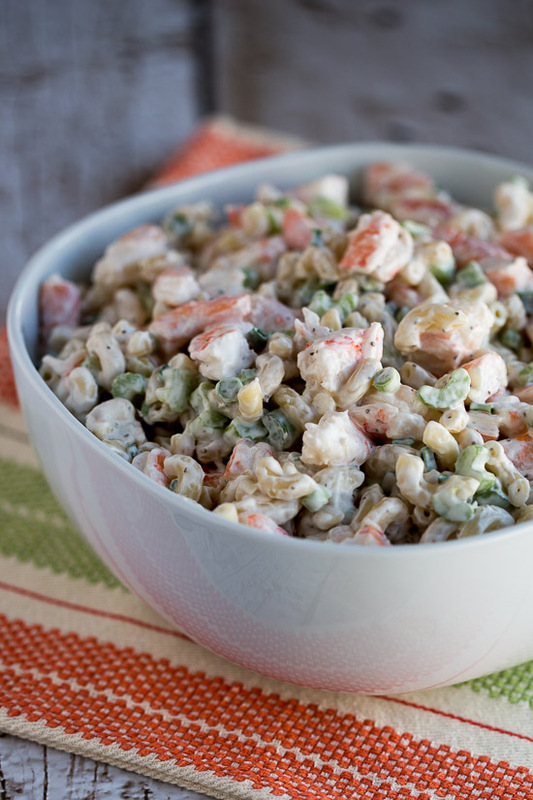 This Shrimp and Macaroni Salad is a dish I’ve made for family parties for more than 20 years, and definitely my father’s all-time favorite dish. I made some Shrimp and Macaroni Salad this week as we gathered to talk about our dad, and I’ll be making it again in a few weeks when my brother Mark hosts his annual Superbowl party. What makes the salad so full of flavor is the idea of using a little of the shrimp “juice” saved from draining the frozen shrimp and adding it to the mayo-based dressing, plus the flavor boost of celery seeds. Notice that the title of this recipe is Shrimp and Macaroni Salad, not Macaroni and Shrimp Salad. I use Dreamfield’s Macaroni and much less macaroni in proportion to the other ingredients to make this salad a more carb-conscious salad. There’s still a significant amount of mayo, but in my family this is a “once in a while treat” that’s perfect for parties. Whisk together the mayo, concentrated shrimp “juice”, lemon juice, and celery seed to make the dressing. When the pasta is cool, mix together the shrimp, chopped celery, and sliced green onions. (Remember, this is twice the amount of the recipe.) Mix the desired amount of dressing into the salad. You may not need all the dressing if you prefer your salads more dry. Chill for a few hours to develop the flavors. This keeps in the refrigerator for a few days, but it probably won’t last that long! 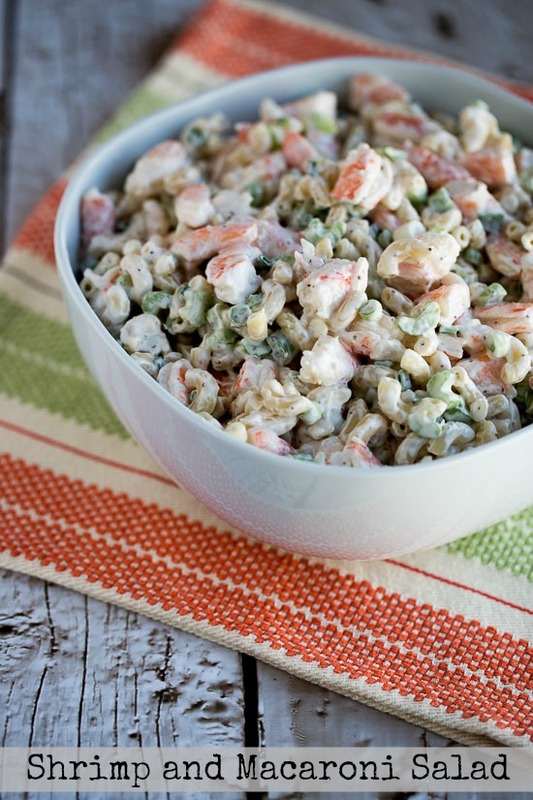 This Shrimp and Macaroni Salad is always requested for family gatherings. Cook macaroni in large pot of salted, boiling water for about 9-10 minutes, or until soft but still slightly chewy. Be careful not to overcook. Drain macaroni and cool, but don’t rinse. While macaroni cooks, dice shrimp, celery, and green onions and put in bowl with a snap-on lid. This is best if chilled a few hours before serving. Will keep in the refrigerator for a few days. I have made this with small “salad ” shrimp or larger medium shrimp, but I greatly prefer the flavor and texture of the larger shrimp. I cut each medium shrimp into about 4 pieces. You could add other ingredients like olives, diced red peppers, cucumbers, or hard-boiled eggs to this recipe. It so tasty. I got a lot of compliments when I brought them to a potluck. Rachel, glad you liked it! Heidi, I've made this for family parties for so many years, now people just expect me to bring it! How cute this salad inspires so many family memories. Doesn't all food? My mom makes a similar version and I can't get enough of it! Stephanie, this is a huge fave in my family. Would love to hear how it turns out with the crab. I'd love that myself. This is fantastic! There's a local place that serves a wonderful crab macaroni salad, and I've tried hard to replicate it and have never been successful. This salad is almost exactly like the crab mac, and the next time I make it, I'm going to use crab meat. I think Rotini would be fine for this. Be careful not to overcook the pasta though, especially with Rotini. Food is never just food. It is a reflection of our lives, and our families, too! Your dad was a lucky man to have you for a daughter! Kalyn, this is a complete meal. My daughter would love it. Your dad and I must be kindred spirits. I, too, love shrimp and macaroni salad. My husband is allergic to shrimp, so when I make it, it's even a bigger treat. (I love shrimp.) I like to add a lot of crunch from celery too. For me, shrimp salad is a little slice of heaven. How delicious! I wish it was closer to summer so I could fully enjoy this dish! Oh yes, this is a good one! I'm sure you're dad is smiling to see this recipe featured. I am loving these recipes as a tribute to your father, but I have to admit, there is certainly a theme there. It seems he really loved his shrimp! As do I, so no complaining here, just thought it was cute to point out. Anonymous, I chose the South Beach Diet to manage my weight because I don't want to have to calculate calories, points, or carbs, so if you want the nutritional information you'll have to calculate that yourself. I do have information with every recipe telling what phase of South Beach it's suitable for. This looks amazing! Am I blind? Where do I find nutritional info? Kalyn, this looks great and I would recommend using quinoa pasta to make it even healthier. While even the high-protein or whole wheat pastas seem to make my husband’s blood sugar spike,we have found that quinoa pasta does not have that effect! macaroni and shrimps… sounds a delicate idea. i’d love to use lots of basils in it and a good drizzle of olive oil and shaved parmesan. good idea, Kalyn!! oh yummy. I love macaroni salad!!! Oh Kalyn, what a wonderful salad. Just looking at the colours..makes me hungry. Neato, never seen shrimp or macaroni salad like this…looks great! Yum! Looks great. I’ve been making this for years but not with celery seeds….just a little celery salt, I’m looking forward to trying your version. We’re making Hot Browns for dinner. I’ll try to remember to get a photo of them. Comments before this one were from early 2007 when I first posted this recipe. Vanessa, I posted this recipe on my family blog and one of my nieces wrote a comment saying how she had fond memories of it, but she always picked out the shrimp because they were just “too crunchy.” So tofu would work for her too! Hiya Kayln -this salad is really bringing back some memories… it’s exactly something my family from Iowa would serve at a potluck and it looks wooooonderful. this may sound just plain wrong but maybe I’ll try tofu instead of the shrimp, just for myself – not so much for my family. Katie, make him peel them, it will be worth it. I wonder why they don’t sell shrimp there without the shells. Interesting cultural difference. Melting wok, this is a big favorite it my family. Paz, hi! I’m glad I made your list. I’m linking to one of your recipes tomorrow! I like the sounds of this. Another recipe to put down on my list. A perfect warm weather salad! Unfortunately here I can only get cooked shrimp in the shells – not raw and not cleaned.